Blatant favoritism for Water, over here. I’m mildly bummed today. An online game I’ve developed a lot of love for is abruptly closing it’s doors. RIP Dawngate. I’m an omega ruby girl myself. Ehh… I stopped buying the games after Soul Silver / Heart Gold. The new Pokemon seemed to weird for my tastes. I’ll play my emerald and ruby cartridges instead if I want to have fun on memory lane. To be absolutely fair, it’s bullshite that the first gym-leader in the first games resists grass and fire, and is immune to electric. re: Dawngate — Super classy of them to offer full refunds to anyone who spent money on the game during its extended beta. I liked Dawngate, but I could understand why they would close down, especially if they weren’t having the traffic needed to be sustained and profitable. Normally I demand a certain degree of realism in my games, but the way they’ve got their elemental checks-and-balances is balanced enough for me to suspend that demand because, ehh, they got the obvious stuff, and it *is* balanced very well so every type is pretty much equally safe. It’s staying online for 90 days while they tie up loose ends, but development has ceased so no new content. On te plus side they are refunding all mkoney spent and they unlocked all the content for people to use while they can. Plants are accustomed to an environment with a certain amount of water. They absorb water through their roots, and many have water-resistant casings (to prevent evaporation). An excess of water CAN harm plants, but an excessive amount of plant matter can also smother a flame, especially if it hasn’t dried out yet. 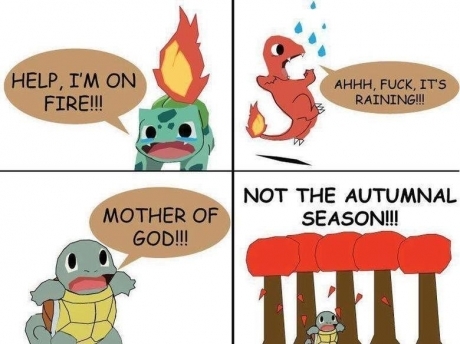 I would call bull if grass types were immune to water, though. In addition, plant-type and water-type pokemon often live in similar/related environments. It wouldn’t surprize me if their ancestors interacted with each-other and/or competed for some of the same resources. If this was the case, it wouldn’t surprise me if the plant-types evolved (in the scientific sense) to possess natural defenses against water types, given that water types have the advantage of not being able to drown with many of them also having the ability to leave the water and get in close on their own terms. Many real-life beings have delicate skin that acts as a semi-permeable membrane protected by a slime layer which prevents them from drying out on land or getting to scraped up climbing over rocks, and given their ability to battle on land, I would assume most water-types have something similar (even if it’s only officially listed in poliwhirl’s pokedex entry). Plants often have a much rougher texture than animals, partially owing to their far more rigid cell structure, meaning that many grass types probably have rough skin (even if it’s not pronounced enough to be classified as the ability ‘rough skin’) which is perfect for rubbing away enough of the protective slime layer to get at the delicate skin. In addition, the fact that their skin is designed to absorb some things would likely make them more susceptible to things like stun spore or sleep powder, and it wouldn’t surprise me if plant types were always giving off small amounts of these substances even when not using a specialized attack that produces massive quantities all at once. Something tells me she isn´t going to be the most attentive of kidsitters. Which is interesting… you would think that if a local high school had a National Honor society, you could get several high school students who would volunteer to be sitters during PTA meetings for hours. When I was in NHS, things that had us working with elementary school students were always fairly popular options. To be fair, it is rather hard for a plant to get its roots drowned if it’s able to, y’know, move away from the waterlogged area. Besides, living plants must need a whoooole lot of nutrition given they, you know, regularly grow new appendages to beat things with and throw parts of themselves at other things and the like. If I were a grass type, I would be one thirsty thirsty plant. Especially since half of them don’t even seem to HAVE roots and spend most of their time in captivity out of direct sunlight. You’ve got to wonder how Grass types compensate for that, energy-wise. Heehee. I think Selkie and Modest Medusa would be fast friends. I too, was sad when Superhero City and Age of Champions closed down, but the last few months were a blast (due to the Moderators, not Electronic Arts) with all the goodies lavished upon the players until the bitter end. Is anyone else hearing Selkie’s dialogue in panel 6 in the voice of Isabella from “Phineas and Ferb”? So, is the game/franchise actually called “Poke The Monsters” in this reality, or that just Rachel’s name for it? Yep, it’s a “generic name substitute”. Like how she also calls the plant-monster type Flower instead of Grass. “Poke the Monsters?” Is that Pokemon + rule 34?! Oh puh-lease. Grass DESTROYS Water, and also pretty much everything that’s not super effective against it.